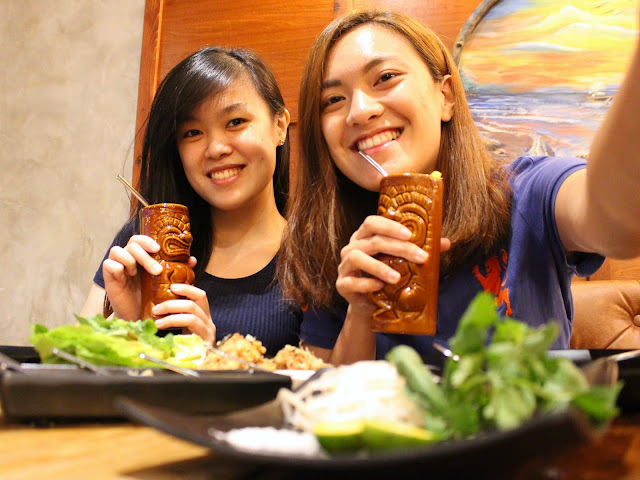 This Nautical Themed Restaurant in Festival Mall Will Surely Get You Hooked! Skewered is a newly launched restaurant under the Phatchick group. The restaurant is located in the new expansion area of Festival Mall, near the river park where its calm and peaceful ambiance incredibly fits. 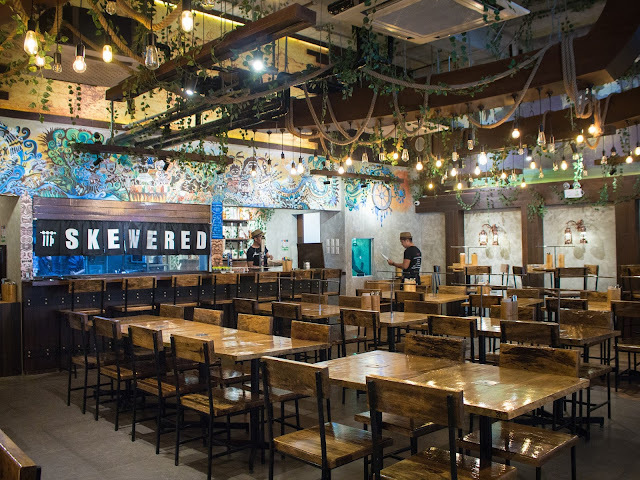 To go with the serene waters of the river park is Skewered's nautical theme. 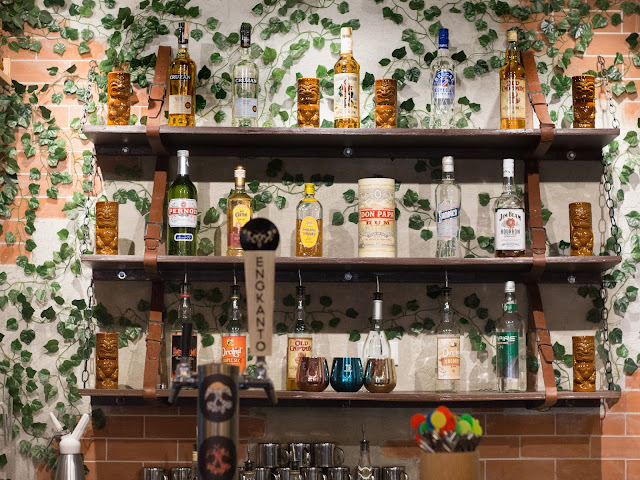 The restaurant displays tropical murals, but the entire restaurant is designed to look like a sunken shipwreck, with vines and hanging ropes, portholes, and other antique-looking lightings and tablewares to complete the vibe. 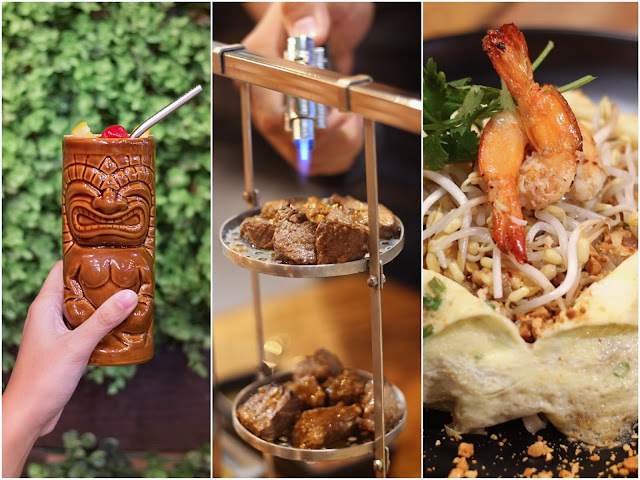 It may seem like a seafood restaurant, but Skewered is actually dedicated to serving Pan-Asian cuisine tweaked to better cater to every Filipino's tastebuds, with the main offerings served on metal skewers. 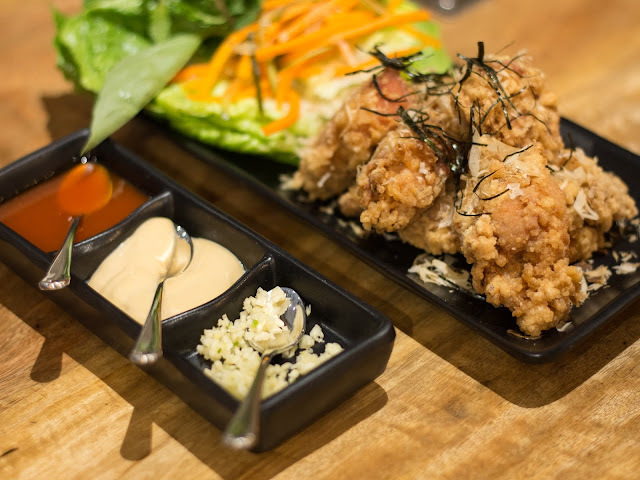 For starters, we had the crispy chicken tenders, a Japanese-style fried chicken (karaage) served with pickled cucumber & carrots, romaine lettuce and fresh herbs, and sauces (salted egg, spicy sauce, and minced garlic). 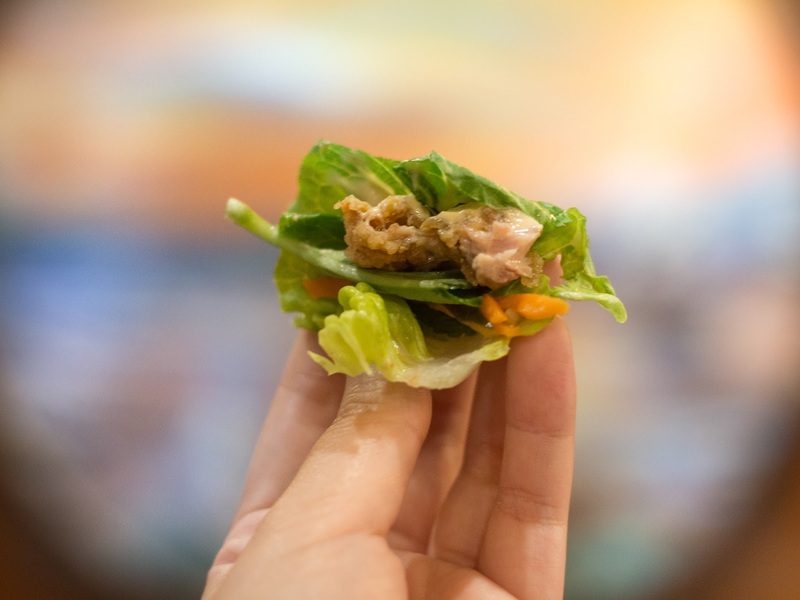 The best way to eat this starter is to wrap the chicken in the lettuce and top with all the other ingredients and sauces. Doing so will let you experience a variety of textures from all the ingredients combined. The Asian Slaw is a light and refreshing salad made of red, green, and Chinese cabbage, romaine lettuce, orange slices & edamame, and served with citrus-sesame soy dressing. 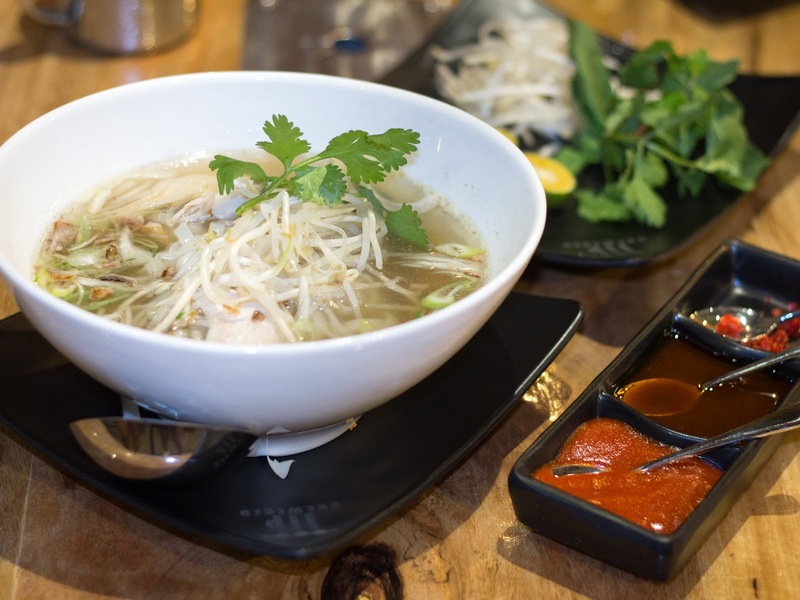 I have tried eating pho once before, but I didn't really appreciate its blandness, which made me never eat one again until my visit to Skewered. Compared to my memory of my first pho, I liked this version because it certainly had more flavor. They also serve extra seasoning and herbs to help you adjust the dish to your liking. 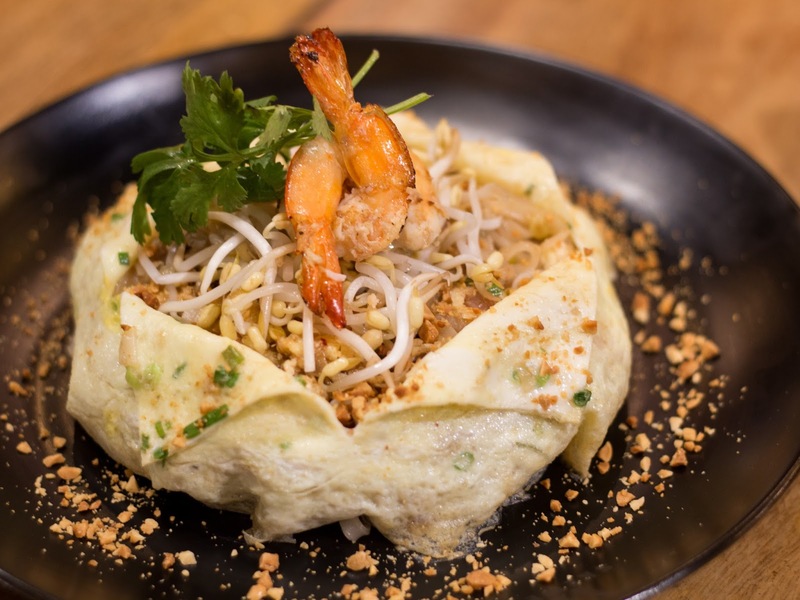 The pad thai is a new dish offered at Skewered, so new that it wasn't even listed on the menu yet. I don't normally think of pad thai as an appetizing dish (because it's just noodles), so I really did appreciate the plating Chef Mark did on their pad thai, especially what he did with the scrambled eggs. I also liked it in terms of taste. 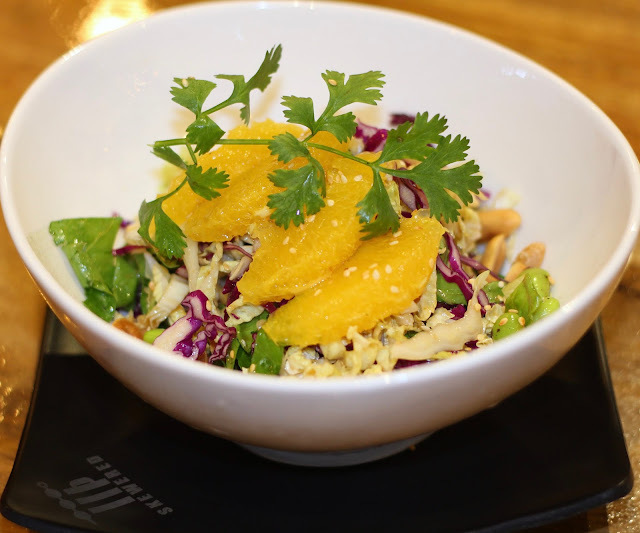 The nutty flavor in the noodles was complemented by a little touch of citrus. I know that Szechuan is supposed to be insanely hot, but Skewered's version of the Szechuan chicken and pork didn't make me reach for a glass of water, not even a little, but it did have a sweet and savory taste you wouldn't normally get from other Szechuan dishes. The Japanese pork belly is one of the most recommended dishes from Skewered's menu, and I totally agree. It's a skewer made of sesame miso-glazed pork belly sprinkled with sesame seeds, and served with more teriyaki sauce. I loved that it's tender, and that the taste of the teriyaki sauce was spot on. Aside from the pork belly, another favorite of mine is the beef salpicao. It's different from the usual salpicao. This version has garlic and butter in the marinade, which is also poured on the beef prior to torching it in front of your very own eyes. Each bite tasted heavenly. Phatchick's fried rice is composed of sweet Chinese sausage (chorizo), scrambled eggs, spring onions, carrots, corn, and green peas. Skewered uses the Chinese lotus rice, which, according to the chef, is actually heavier than the normal rice. A cup of rice was very challenging for me to finish. For dessert, we had the banana Malay roti, which I have been eyeing on since I first glanced on the menu. My friend and I like to think of it as Skewered's version of a crepe, with the roti as the pasty, and ripe mangoes & lakatan banana as the fillings, topped with coconut cream & peanut sauce, and crushed peanuts. I honestly expected more coconut cream from the dish, but after having a taste of it, I'm not so sure if adding more of the coconut cream would make it taste better or just taste a little too heavy. I liked it, still. 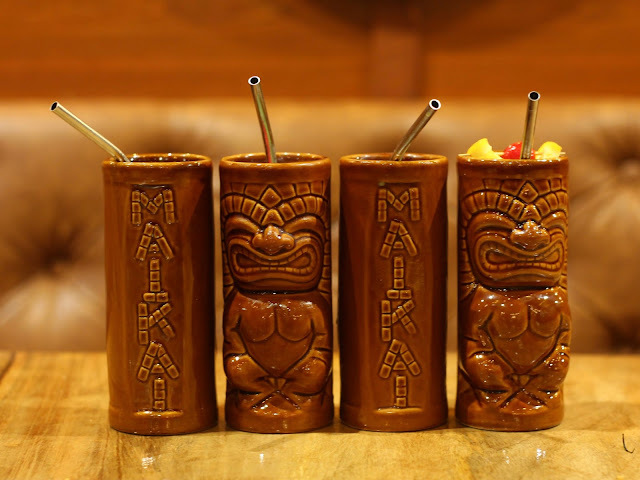 Ordering a drink at Skewered is a MUST, especially since their tiki cups are just so adorable you wouldn't be able to resist! 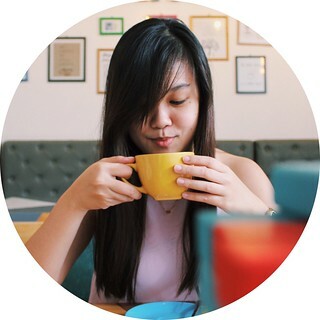 I tried their matcha milk tea and Thai milk tea.If you're expecting the strong taste of brewed tea from their tea drinks, then I say don't. Expect the unexpected, really. They use a certain tea that they import from China, which is more fragrant that you can actually taste that fragrance. This "fragrance", for me, added a bit more excitement to the drink, drawing the line between a teen's and a tita's tea drink. I had such a wonderful dinner at Skewered. The restaurant may be on soft opening, but it is definitely running smoothly, with everyone on the team doing their share in making our visit memorable. The service, the ambiance, and the food were all excellent. Love it! Craving for their Banana Malay Roti! Craving for the beef salpicao!! !